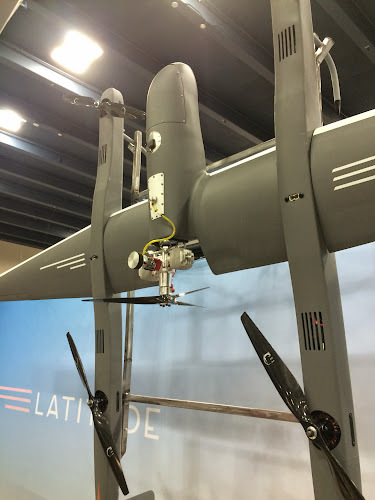 I stopped by the Latitude booth to take a closer look at their UAV. It has a payload of 5kg and can cruise for 12 hours. The battery life for vertical operation, i.e. take off and landing is about 5 minutes. 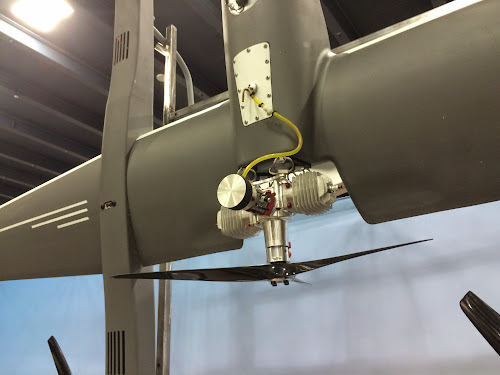 This could be extended but at the expense of payload or fuel for the gasoline engine. In case you can't tell, I am fascinated by their design. The design is for autonomous operation though you are required to maintain a radio link in case it need to be deliberately brought down, i.e. another aircraft enters the flight area. 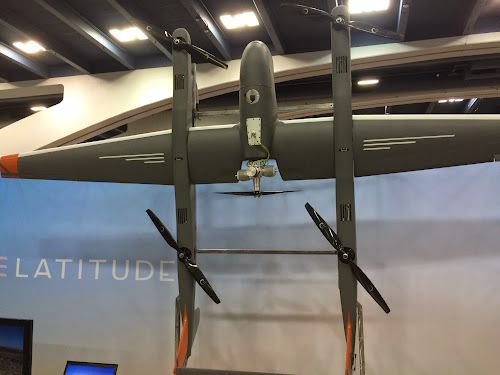 This is larger than the typical UAV so it should help it being seen. The company also has an unmanned Cessna 172. As you might imagine, the instrument payload is pretty impressive once you eliminate the people. But it is not designed for VTOL so you would have to have a convenient runway. The mentioned that they are planning to be in Barrow in the summer of 2016. The gasoline engine should look familiar to anyone who played with model airplanes. It is essentially a horizontal twin, two cycle, compression ignition engine (i.e. diesel) with glow plugs for starting only. Those are the things looking like spark plugs in the heads. I also stopped at the Spectral Evolution booth just to sort reminisce a bit. 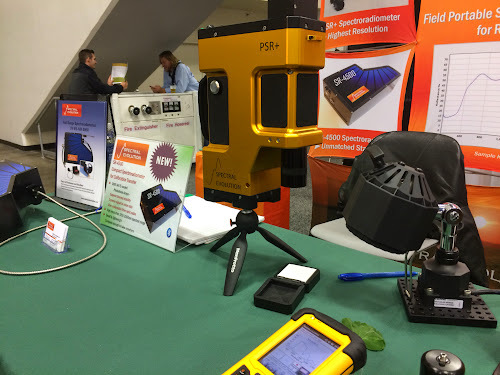 They manufacture and market a visible-near infrared portable spectrometer modeled after an instrument I had worked on some 40 years ago. It has lost 90% of it's weight and volume, higher resolution and, I suspect, is much more reliable. They even had some pictures of the original unit. There were a number of presentations on modeling the future of multi-year sea ice in the Arctic and the projection hasn't changed much. Somewhere between 2030 and 2050 was the estimate of when the sea ice coverage drops below 1 mil sq miles. That's the threshold that some have come up with for complete thawing of the North Pole. Another interesting tidbit of information is that the Greenland ice sheet holds enough water to raise the sea level by 7m. What is also significant is that recent times have the entire ice sheet melting at the same time. 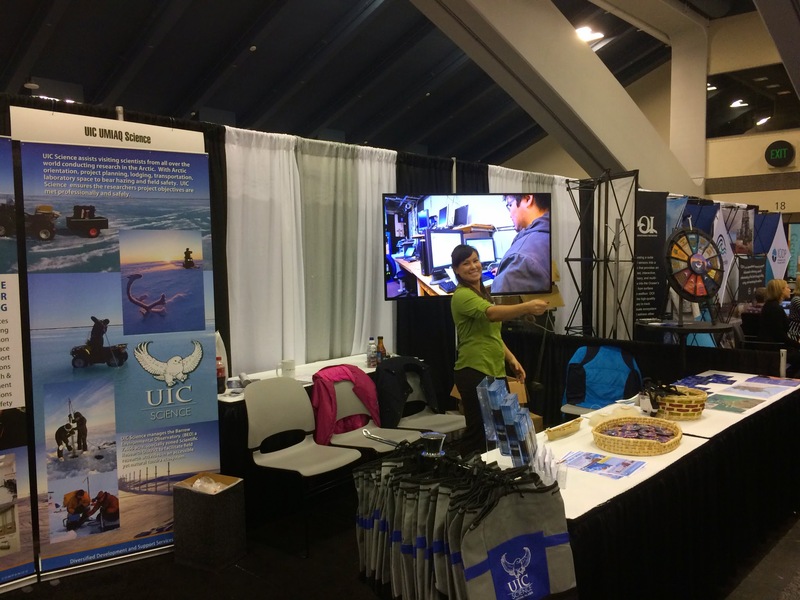 This is the Umiaq booth, the science logistics provider in Barrow, with one of their staff members doing a demonstration of an Inupiat yo-yo. There are normally five people in their booth but they are standing back for the demonstation. Sorry about the vertical form factor on the video. In addition to the Umiaq booth the other Alaska booths are UAF research and Toolik Field Station. The Toolik booth had extra comfy seats for resting and I know this is a stretch, but the Toolik manager rides an R65 airhead. How's that for getting some minimal moto content into this post.